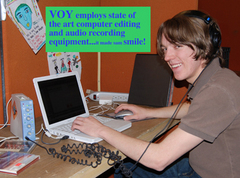 Voices of Youth - Moab (VOY) is a creative documentary project for high school aged teens in Moab, Utah. (Look on a map to see where Utah, Colorado, Arizona and New Mexico come together, google Moab or look for Arches National Park, it's in our backyard!). VOY started as a project of the Western Folklife Center in Elko, NV in 1999 and moved to Moab in 2002. The project is currently two-fold: a winter trimester radio course followed by a Summer RadioWORK experience where selected students are paid to make radio about their community (a healthy alternative to delivering pizza!). We focus on topics related to our community, whether big or small. Work ranges from personal essays to documentaries on local lore and lifestyles. We are a diverse community and that is reflected in our productions. We employ Apple ibooks, DigiDesign's ProTools software (the best!! ), Shure mics and Marantz PMD660 Recorders. Our primary partner is KZMU-FM 90.1 Community Radio, where all work is premiered and archived (www.kzmu.org). In 2007 we were recently honored with a Utah Broadcasters Silver UBEE Award. For additional information feel free to contact VOY-creator/director Bruce Hucko. bhucko@frontiernet.net or 435.259.4176 Thanks for listening! The Truffula Trees and WE! Two Moab boys making hip hop music.